WHY NOT BRING A FRIEND FOR HALF PRICE? As you come out of winter, are you ready to let new life in? Do you feel content? In good spirits? Sometimes the end of winter can leave us a little flat-spirited, life feels a little mundane, we can feel impatient for change. Spring feels so close – but not quite here – (although right now it feels as if we’re in mid-spring!) – this is a perfect time to explore how yoga can fight the blues, reconnect us with life’s ​energy and realign to the​ meaning in our ​lives. Partly, Yoga can help to get our energy flowing, to raise our spirits. The practice also allows us to enquire into how we can tune in to an innate joy and happiness in our daily lives, especially through cultivating feelings of gratitude and wonder in all that we experience. The workshop will be inspired by ​Santosha. Santosha is a Sanskrit term and underlying principle in yoga meaning satisfaction and contentment. Contentment doesn’t mean complacency here or a short-term fulfilment of desires. Rather, understanding and practicing with Santosha helps us to see how we tend to always wish things were different or judge ourselves as inferior to others. These are merely habits that make us miserable. Santosha helps us fall back in love with the minutest of details in how we experience our bodies, our relationships and the world around us. Come and join me in Letting Life In and explore what it feels like to be thankful for being alive! As in previous workshops, we will combine Yin followed by Yang Yoga. 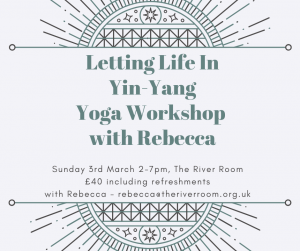 In the Yin session we will target the Spleen and Stomach meridians to cultivate a feeling of harmony and acceptance; a feeling at ease with who we are, wherever we are. We will then allow this ease to flow into the Yang session, which will combine an uplifting anti-blues flow with some simple partner yoga to explore trust and compassion in the postures. We will explore how being fully present in the postures, breath, relaxation develops a warm sense of connection with life’s energy. For the partner yoga, you may work with someone you’ve brought with you or with someone else in the room. It’s all good. Cost: £40 and refreshments are included. Full payment is essential to confirm your booking. Please email me at Rebecca@theriverroom.org.uk for bank details.